Looking for a low-carb start way to start your day? 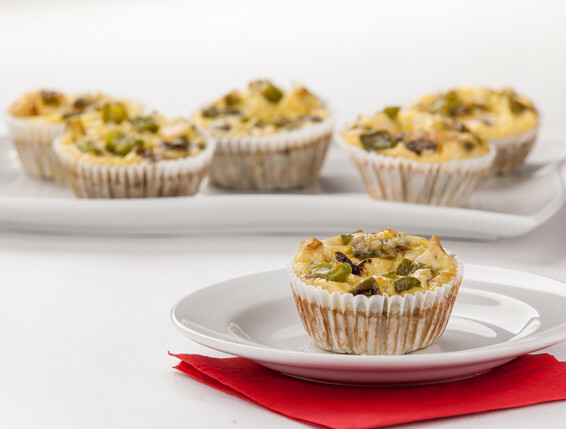 These little frittatas make a quick and healthy breakfast! This recipe is just a start, so feel free to experiment with different veggies, such as zucchini, asparagus, or spinach. Preheat the oven to 375 degrees F. Line a muffin pan with muffin papers. Spray a sauté pan with cooking spray and heat the pan over medium-high heat. Add the onions and pepper and cook for 5 minutes. Set aside. In a medium bowl, whisk together the remaining ingredients. Add the green pepper and onions to the egg mixture and mix well. Pour the egg mixture into muffin cups, filling each about 2/3 full. Bake 20 minutes or until the centers of the frittatas are firm.